It was an epic day when the meeting of two great clans took place, actually, it was just my parents meeting Steve's mother, Joyce, for the first time, but it felt epic. 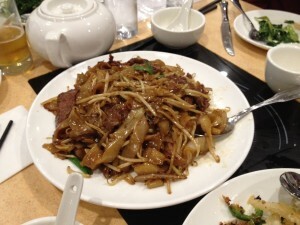 Originally, Joyce invited them to the Winchester Country Club, but my mother's dietary restrictions (which is to say Mama Tsoi only eats Chinese food) caused a venue switch to Yong Yong in Malden. My parent did some reconnaissance, including a trial run, before suggesting the restaurant. My mother told me the food was good, there was parking and the bathrooms were clean – what else do you need for such a momentous summit? There was an overabundance of food, but my mother was worried that Steve and Joyce would not find anything they wanted to eat. 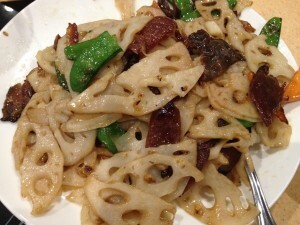 Her fears were unfounded; they seemed to like all the food, even the lotus root, which was new to them and certainly the most authentic of all the dishes. The food has high points and low points. 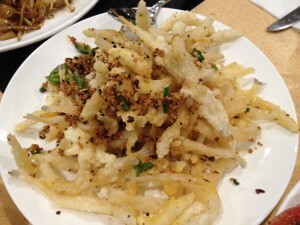 The aforementioned lotus root had a great crunchy texture and was enjoyed by all. My favorite was the smelt; the small fried fish were light, crispy and easy to pop in to your mouth. It was the only dish we completely finished. 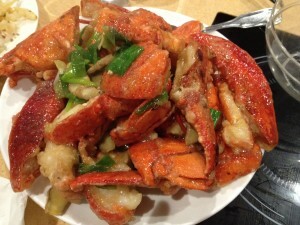 The lobster was a generous platter of tender lobster, perfumed with the ginger and scallion. The lobster is hacked in to pieces, in the shell, which is traditional, but difficult for those unfamiliar to this style. This is how it will be served at our wedding. 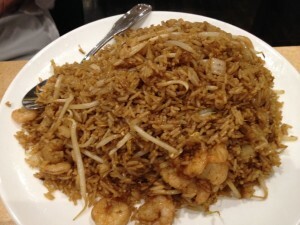 This was the small size of the shrimp fried rice, if you can believe it. The chow foon was too greasy, the chicken too salty and the water spinach came sautéed with fermented tofu (which I LOVE) but we had ordered it with garlic, as fermented tofu is pungent and may be too strong for American palates. However, there were no complaints. My mother was clearly nervous; she couldn’t stay in her seat and got up multiple times for things that a waiter normally does (she ordered the lobster before the waiter came to our table, she got forks and knives for Steve and Joyce, she got extra napkins, and she even went and got toothpicks at the end of the meal!) My father was typically stoic, minimally contributing to the conversation. But, the meal flowed with only a few awkward moments and at the end I can deem it a success.